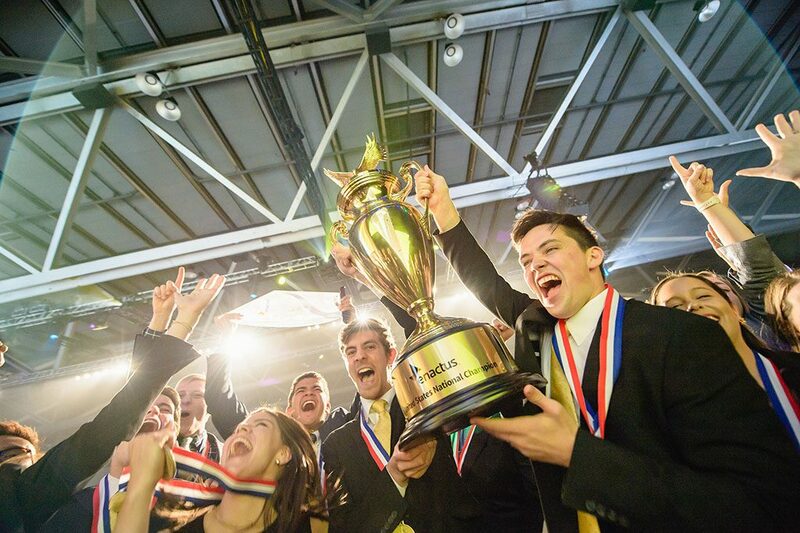 Anyone who has had the opportunity to attend an Enactus event knows they are about so much more than the competition. They are about coming together to showcase and celebrate the work and impact made by teams over the year, about recognizing achievement and collaborating on new initiatives. 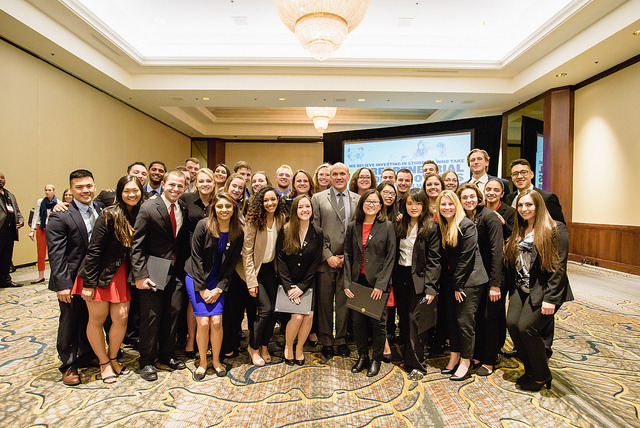 Throughout the three-day Enactus USA event, from 21 to 23 May in Kansas City, we saw lots of evidence of this, including veteran teams serving as mentors for developing teams to ensure they maximized the experience. 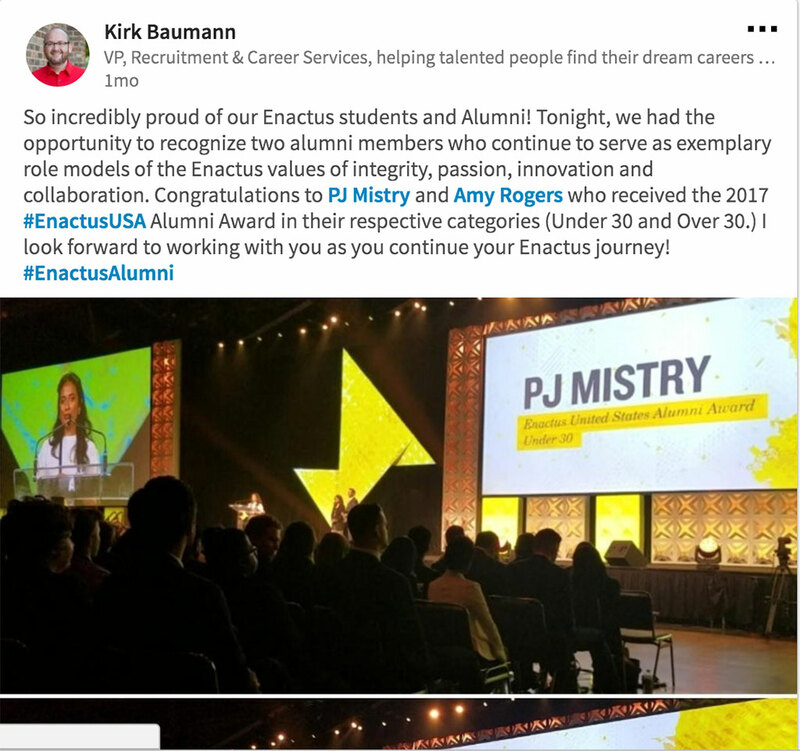 This was also on display with the induction of the very first Enactus Student Fellows, which took place at a special reception sponsored by BNY Mellon. 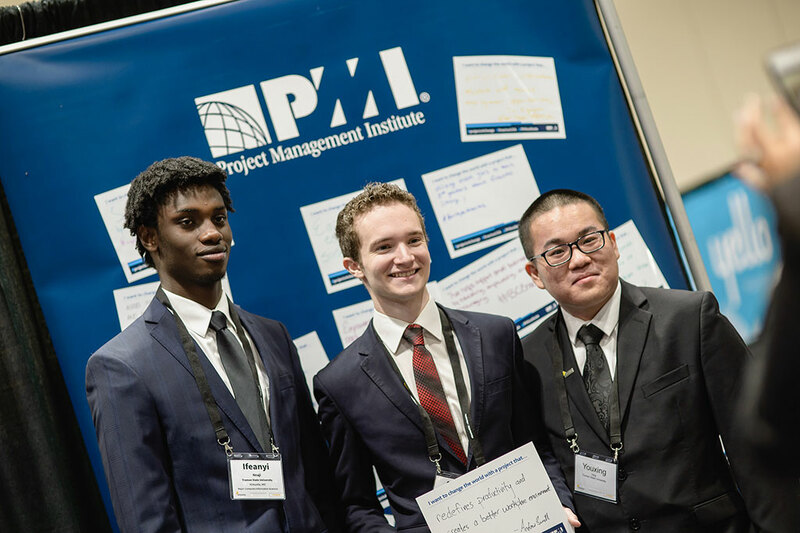 To receive this recognition, the 43 inducted students focused this past year on entrepreneurial thinking, earning an internationally-recognized Project Management certification, and studying financial skills in a free market economy. 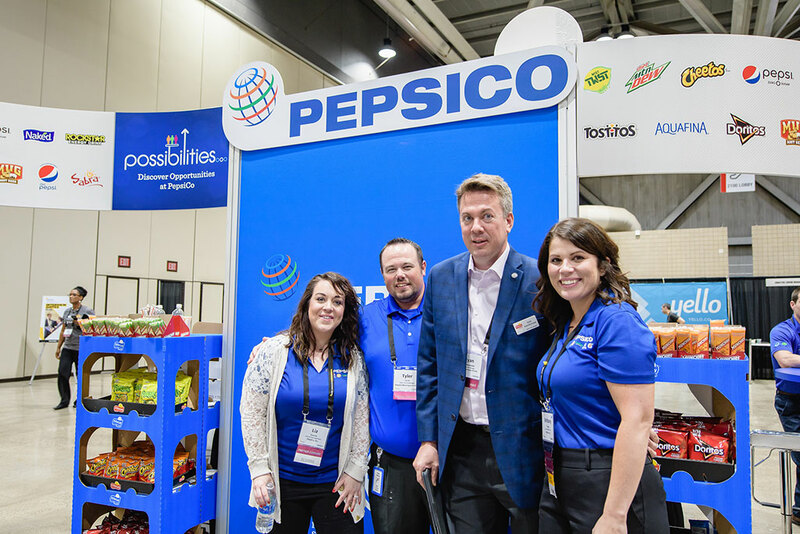 An additional highlight of the Enactus USA National Exposition was the amazing Career Fair, which engaged 37 companies all vying to meet, engage and network with the 1,300 incredible students and hundreds of alumni in attendance. Another notable feature of this year’s event was the involvement and recognition of alumni. There was an official alumni booth to connect graduating seniors with alumni members, an alumni reception sponsored by Unilever, and an official “pinning” ceremony to welcome the new members. The 2017 alumni award winners were also named, and these individuals now have the opportunity to represent the US at Enactus World Cup. What’s more, there was an alumni gift matching challenge that raised nearly $2,500 onsite! Clearly, Enactus doesn’t end at graduation! And there was no shortage of entertainment for the nearly 2,200 supporters in attendance. From Master of Ceremonies Jeff Houghton to the Marching Cobras and Gracie Schram, plus the inspirational speakers throughout the event, attendees truly experienced all the feels from the main stage. Of course, we can’t forget the national competition, which included 104 teams in three rounds of competition. These teams had all won a regional competition and came to Kansas City with the national title in their sights. In the first round, 192 executive judges narrowed the field to 16 teams, who then presented on the morning of the last day to 82 judges. Those judges had the difficult task of selecting the final four teams to present on the main stages to 51 of the country’s top executives. 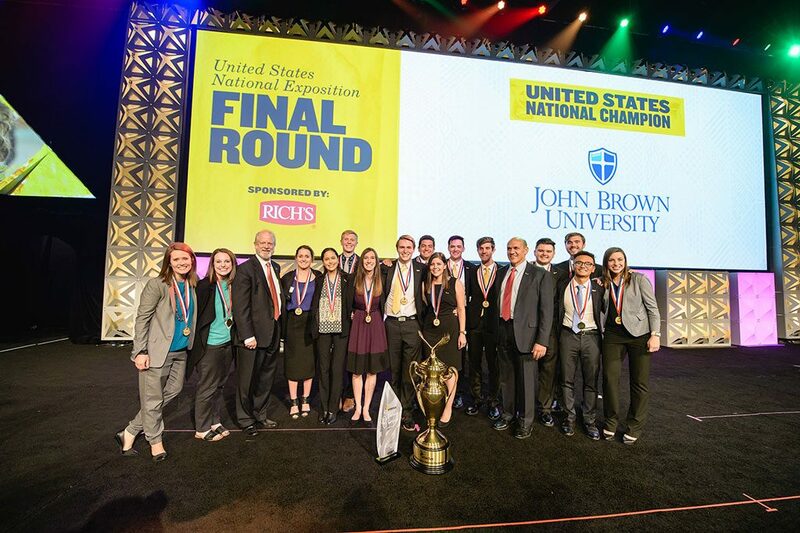 In the end, the team from John Brown University was named National Champion, impressing judges with their 11 projects including Yellow Crate, which enables local food pantries to send automated requests for donations through an app to individuals in their community at the point-of-purchase, scaled in partnership with four other Enactus teams. The team will now prepare to represent their country at the Enactus World Cup taking place in London this September. Speaking of the World Cup, Enactus President and CEO Rachael Jarosh was on hand in Kansas City to make an exciting announcement: the location for the 2018 Enactus World Cup. Next year, thousands of Enactus supporters from around the world will come together in Silicon Valley. 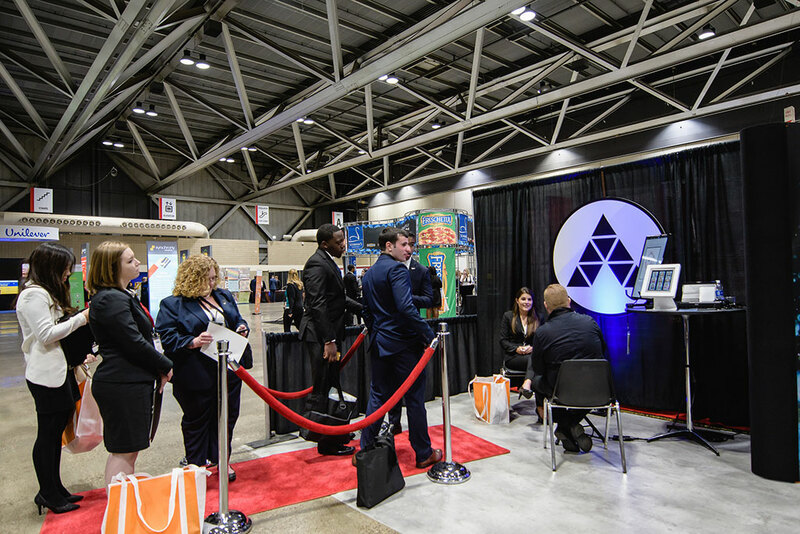 Want more from the exciting Enactus USA National Exposition? See all the highlights in this great flashback video!